The Tucson Homeskillet: Yogi's Indian Cafe & Market Is Going To Be Your New Favorite Spot For Food And Goods! Yogi's Indian Cafe & Market Is Going To Be Your New Favorite Spot For Food And Goods! When I first discovered Yogi's the sign outside on the wall was a mere stencil. I was on my way downtown for whatever reason, driving on Stone Ave, when I just happened to look to my right and see that a new market and cafe was opening up next to a TV repair shop. Then I thought: Do they still fix TV's? I mean, long gone are the old tubes and curved glass screens so...I don't get it. Maybe they repair BetaMax machines and can fix up my old Atari joystick too. Who knows? Point is, I made a mental note to return to this little nook at 2537 N. Stone because the market and cafe wasn't just any ol' cafe and market, it promised to be that of my longtime culinary obsession. It was an Indian Cafe and Market. A few weeks later a 'Now Open' sign donned the exterior and I just had to go in. Still dusty from recently opening boxes, unpacking goods and stocking the small yet vibrant vegetable patch, I looked around and was pleased to find so many hard to find spices and foods. Sure there are other Indian owned shops with similar items for purchase here in Tucson but Yogi's seemed a bit more ambitious about what they keep and sell on the shelves. Intrigued, I grabbed a basket and filled it up with the intention of attempting to cook as authentic Indian as I can one night for dinner. Honestly, in all the years that I have done this, trying to cook real Indian food, I have never come even close to the deep character and richness of flavor that true Indian cuisine offers. And, believe me...I gave it my all each and every time. So perhaps this time around, with the help of Yogi's, I can do it. That's when I happened to meet the owner of Yogi's, Satye Bhati, a man who smiled wide under his bushy mustache as he inquired about my purchases and welcomed me to his shop. Busy with trying to juggle the lunch crowd for his cozy cafe area and the business at hand of operating a brand new store, he took some time to chat with me about how Yogi's came about. "When I first moved to Tucson in 2003, the first thing I noticed was the lack of Indian groceries and restaurants," notes Satye. "This always bothered me because Tucsonans were missing out on a major cultural and cuisine experience of the world. "But when the opportunity presented itself, I just had to accept the challenge! And, let me tell you...it has been quite a daunting task so far!" 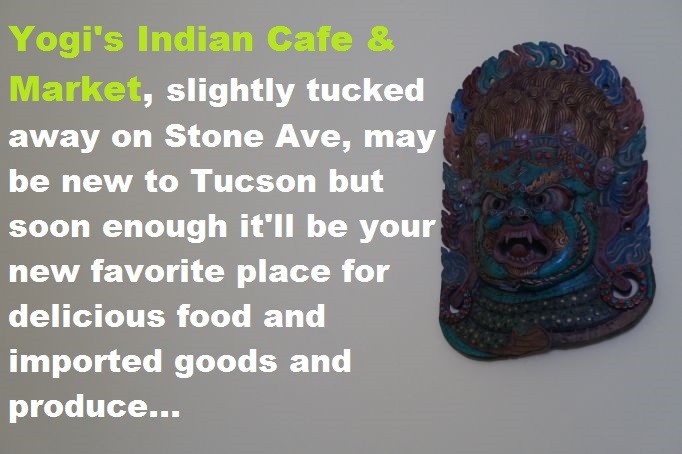 Owning a small business is one thing, especially in Tucson, but Yogi's is a two-in-one concept so the addition of a full scale Indian restaurant on top of a retail shop selling "exotic" goods has to be, as he said, daunting. "Indian cuisine," continued Satye, "when done properly, is a very involved process. We take pride in not cutting any corners when it comes to preparing the food!" That right there grabbed me and I knew I needed to try the cuisine. So after purchasing my items, I walked into the back cafe area and ordered me a plate or two just to see what he was talking about. The restaurant, just like the rest of the establishment, was brand spanking new, but instead of boxes and dust, the cafe was so clean and crisp you could almost smell the recently applied white paint among the shiny surfaces barely touched by plates or hands. Unlike most Indian restaurants that I have been to and thoroughly trust, the cafe was near sterile and for some reason that threw me off. For a second I didn't trust that such a spotless Indian eatery could live up to Satye's hype, but when the food arrived I was quickly proven wrong. The naan bread was some of the fluffiest and tastiest I have had almost anywhere. That paired with the brightness of their mint sauce quickly switched my preconceived sentiment that all good Asian restaurants need to be chock full of variant smells, random stuff on the walls and cramped seating to be legit with their food. I mean, c'mon!, Yogi's just opened up and I knew it wouldn't take long before the patina of constant good cooking will quickly give the cafe area the look and feel of a well oiled kitchen. The rice was perfect, the spice on the mixed vegetables were excellent, which is a task because so many Indian restaurants skimp on the attention that side items need. The produce was so fresh and lively and it only made the main dishes come alive as all good "side items" should do. Love the painting but admire the frame that it sits in...so to speak. My Tandoor Chicken fell off the bone and was so vibrant with color and expert seasoning that I couldn't hold back my usual and often vocal "yummy" sounds as I pillaged on with enjoying the succulent texture and flavors. This went with the Choley, which is a relatively simple dish of white chick peas cooked with ginger in a smooth simmering sauce, was delectable and packed with quaint savory goodness. It's real easy to get Indian food wrong, such as my attempt at being a home cook of the variety, but it is also incredibly difficult to get Indian food right. I am here to say, even in their infancy, Yogi's does it right. The best part is that their cuisine has a certain lightness to it, which I thoroughly enjoyed. The sometimes over sauced and weighty stature that some Indian restaurants pride themselves on is pretty much done away with at Yogi's. Perhaps its the region from which the family derives from or most likely its just a conscious choice, but you wont leave Yogi's feeling bogged down by too much of too much. Oh, you'll leave feeling like you got your fill but the care in the way they cook and what they are cooking with comes forth in a conscientious formula of proper portions and just the right amount of spice and sauce coupled with the main component. To sum up: Yogi's food just makes you want to come back for more because you weren't overstuffed in the first place. There's always room for more visits here. Which I have done and plan on doing. "Unfortunately, for the grocery side," Satye continued as I drooled over my Gulab Jamun, which are small doughnut like balls of sweet awesome drizzled in a rose water syrup, "there are no local suppliers here in Tucson so we have to source all of our products from the importers in Los Angeles, and, that too proves a challenge. "However! All of the efforts become worth it when we see the good people of Tucson rejoice in our food and experience here at Yogi's." And that, dear readers, was exactly what I was doing. With an extremely satisfied belly filled with incredible cuisine and a sack beaming with potential cooking mastery, I headed out and thanked everyone, including Satye, who had just one more thing to say before I left. 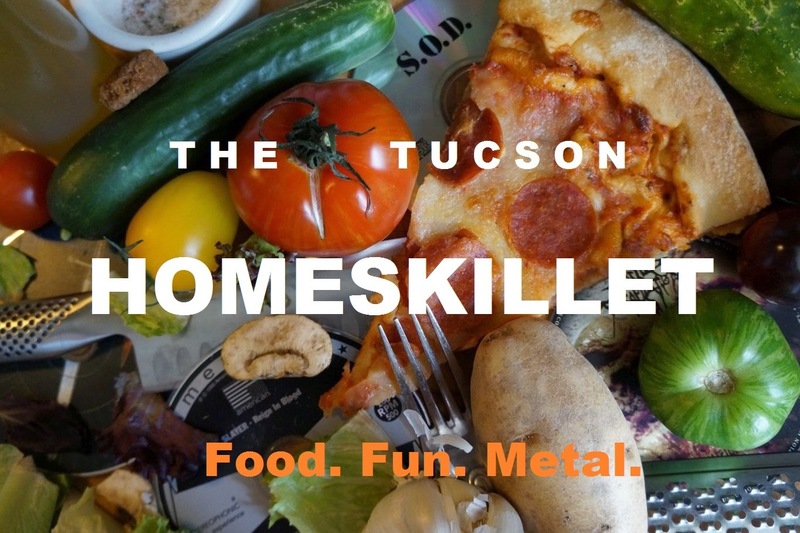 "We just want to present honest and authentic Indian products and cuisine to Tucson while also trying to educate about the health benefits of these foods. This is cuisine that has been studied and evolving over the last 3000 years or so. And I hope that you take that with you until the next time we see you." Oh, I did and, oh, they will see me and have seen me again. PS: Sure the products and spices I bought were great but, yeah...no. I just didn't nail my Indian inspired dinner like they did at Yogi's. So I'll just leave the real Indian food cooking to the experts and I 'll stick to eating it. That's what I'm good at anyway. I like this place. I was here the other night, I've been there for about four or five hours and found the prices reasonable on all fronts and the staff to be so friendly. I would be the perfect person to have on an infomercial for this venue Houston TX if they ever had one. You will enjoy Indian food with best night club for any event such as birthday, anniversary, wedding party and any corporate party in Bikaner. We arrange complete event in affordable price in Bikaner.